Superhero art is no longer confined to comic books and graphic novels. 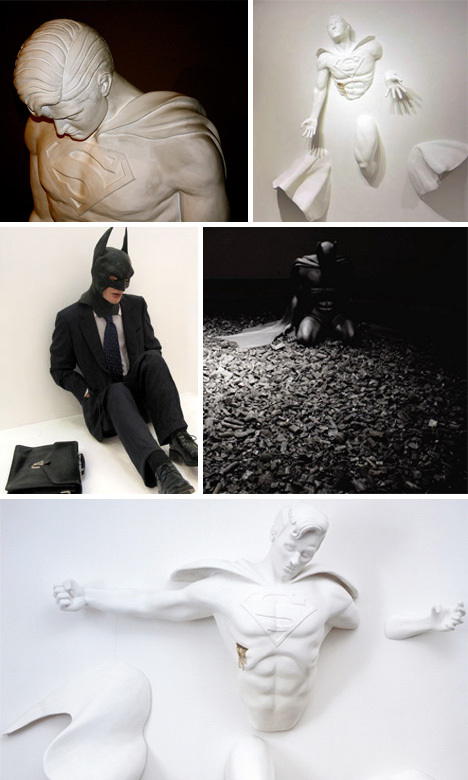 Breaking free from their two dimensional boundaries, superheroes are now the stars of their own art exhibits. Superheroes of one’s youth can have a huge influence. Whether the morality tales make ethics stronger, or the powers and action simply steer one towards being a geek, these super tales can have a lot of power. 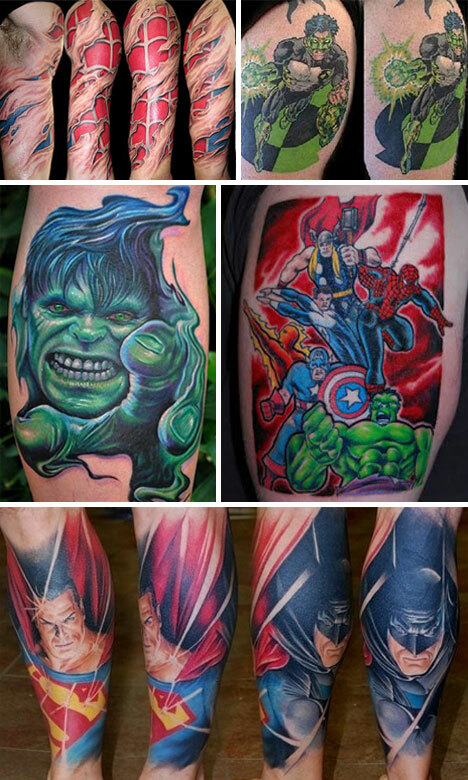 It’s natural, then, that adults would want to show off these influences in gorgeous tattoos. A permanent testament to something that helped shape their lives. 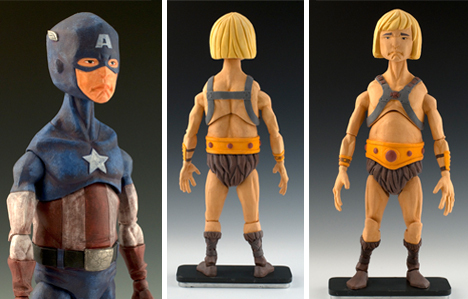 These antique-looking superhero sculptures are the creation of the talented artist Calvin Ma. They look like figures straight out of a rickety farmhouse, but are actually just skillfully styled. The artist Michael Myers has created a unique vision of his favorite superheroes, using clean lines and vintage sensibilities. 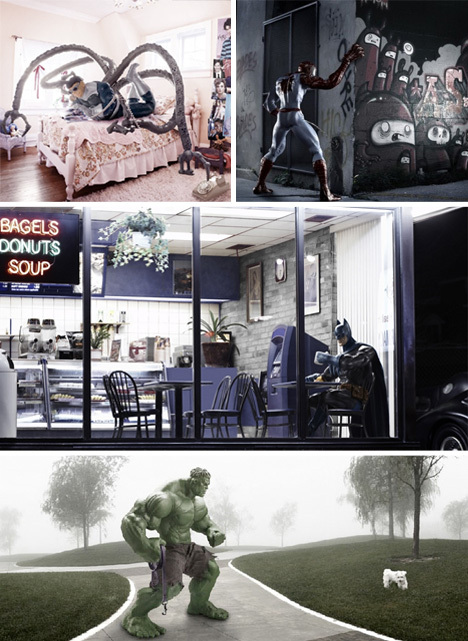 Photographer Ian Pool, based out of Toronto, creates fantastically mundane superhero art that brings these larger-than-life creations into the middle of hilariously contrasting modern life. Learn more about Ian Pool here. 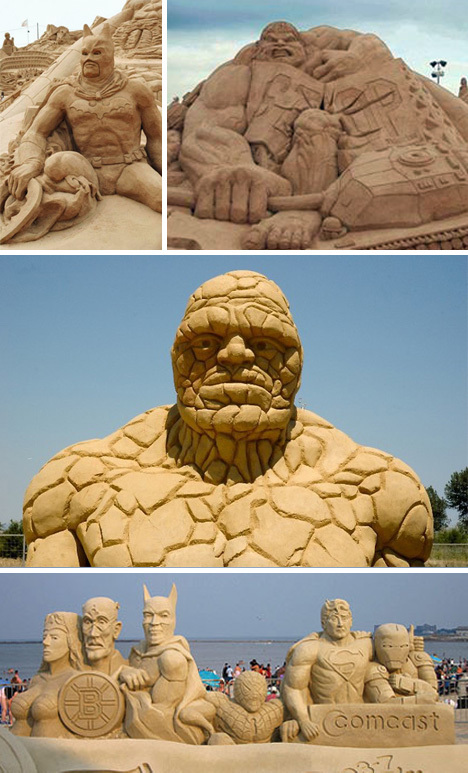 Superheroes aren’t the most common subject of sand sculptures, but these gritty visions are a great example of how integrated these characters have become in world culture. 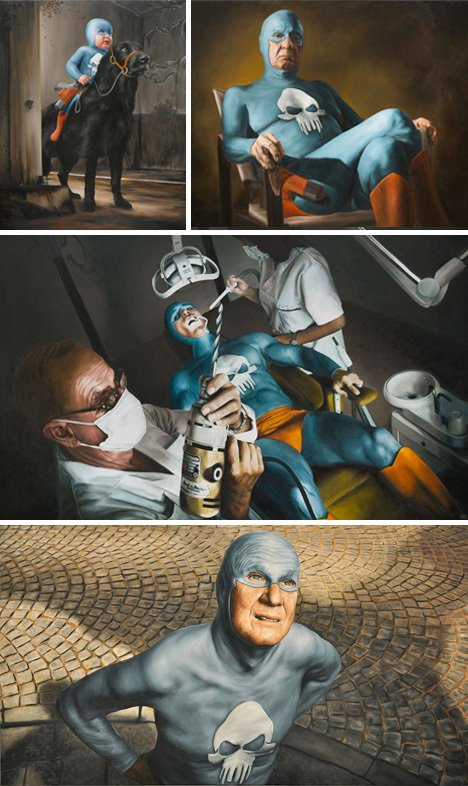 Artist Andreas Englund expands on the trend of superheroes being placed in mundane settings and situations with his extensive portfolio encompassing scenes from the life of his own superhero. 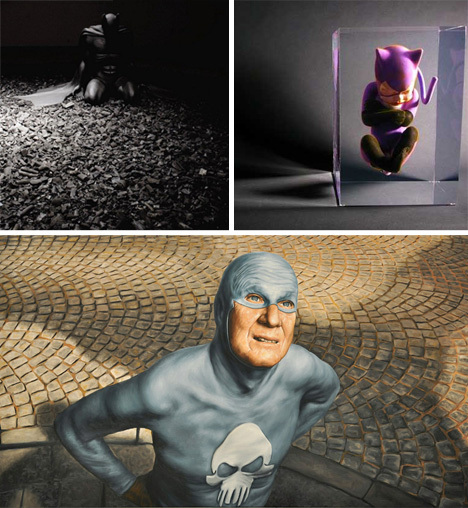 Alexandre Nicolas’ beautiful fetus sculptures show the most famous superheroes as they’ve never been seen before. What would these heros have been like if they were born with their powers? Heroes: The Route of Exposure by Adrian Tranquilli elevates superheroes to a new level of sophistication. Want to leave the art gallery and see some real life superpowers? New York City was recently the scene of an amazing development in human flight.